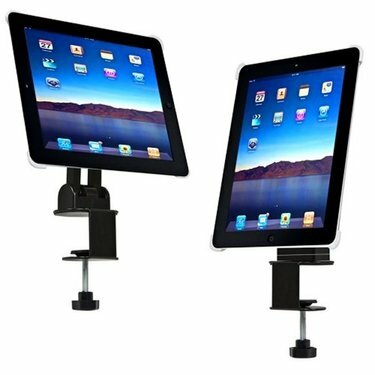 Mount your iPad to a desk, table, or counter using this Monoprice Desk Mount Swivel Stand! This iPad stand is designed to fit the iPad 2, the iPad 3, and the iPad 4 with Retina Display. It features an adjustable C-clamp, allowing you to attach it to the edge of a desk, table, or counter. The clamp can be attached to surfaces as thick about 1-3/4". Once mounted, the iPad can be tilted 180° and can be rotated 360°, so can easily switch from portrait to landscape orientation and back again. Clamp can be attached to surfaces as thick as about 1-3/4"